Caroline Mulroney is defending Ontario's use of the controversial provision. Former prime minister Brian Mulroney and his daughter Caroline arrives for the Spirit of Hope benefit in Toronto on May 31, 2010. Former prime minister Brian Mulroney says that while he continues to have personal issues with the Constitution's notwithstanding clause, he does not think it is an illegitimate tool for governments. Mulroney famously argued that Section 33 of the Charter of Rights and Freedoms made the charter "not worth the paper it's written on." He also called the clause a "fatal flaw" of the Constitution. The highly controversial provision allows Parliament or provincial legislatures to pass laws overriding certain sections of the charter for a five-year period. His positions sparked renewed interest Tuesday after Ontario Premier Doug Ford said he would invoke the notwithstanding clause to move forward with legislation to slash the size of Toronto's city council. On Monday, a judge ruled the law infringed on the freedom of expression of city council candidates and voters. The former PM's daughter, Caroline, serves as Ontario's attorney general. Though she was not by Ford's side when he announced the gambit, she later tweeted her support of the move and will have to defend the government's decision. 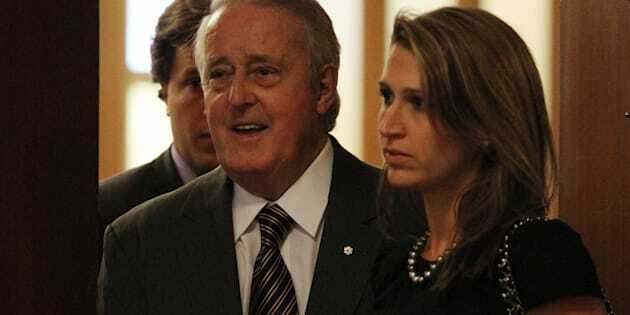 Speaking at an event at Library and Archives Canada in Ottawa Tuesday, Mulroney reportedly told an audience member he wanted to avoid discussing the notwithstanding clause for "all kinds of reasons." But he could not avoid the topic while facing reporters later. Asked if he was concerned about premiers using the tool for what might amount to comparatively minor matters, Mulroney said that governments in Saskatchewan and Yukon, for example, invoked the clause for "relatively peripheral issues." Saskatchewan used the clause to protect back-to-work legislation in 1986. Yukon invoked the clause in 1982 on land development legislation that never went into force. Former prime minister Pierre Trudeau would not have included the clause in his constitutional package if it was "evil," Mulroney said. "If it's part of the package, it's not anti-democratic to use it, to invoke it if you're the elected premier of a given province," he said. Still, Mulroney said it's "no secret" he's against the tool being used to override decisions from the Supreme Court of Canada. "For me, the backbone of our democracy, the strength of our democracy is the independence and confidence of the court system in Canada," he said. "We have one that would rival any in the world." Mulroney also told a reporter he was never tempted to use the notwithstanding clause during his nearly nine years as prime minister. "And no, I haven't discussed this with my daughter," he said. Mulroney also seemed to take an oblique jab at U.S. President Donald Trump during his earlier remarks when, according to reporters, he described the "thoughtful" leadership of former president George H.W. Bush as a contrast to "what you're seeing today." Asked about that later, Mulroney said with a smile he was describing an "abstract concept." Bush Sr. is a "marvellous guy," easy to get along with and a great friend to Canada, he said. "That was then and now is now," Mulroney told reporters. "Now we have President Trump who is, shall I say, unorthodox in some of his views." Mulroney has provided advice for Prime Minister Justin Trudeau as his government negotiates a revamped North American Free Trade Agreement. He expressed confidence that Trudeau — who he called a "very charming young man" — can get beyond his "rough patch" with Trump. The president is "almost Irish sometimes," Mulroney joked. "He's very mercurial. He's up and he's down."